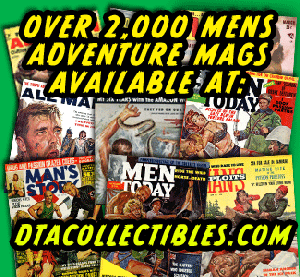 Men's Adventure Magazines: Merry Christmas, men’s adventure magazines style! It’s not too surprising that there aren’t many issues of vintage men’s adventure magazines had Christmas-themed covers. 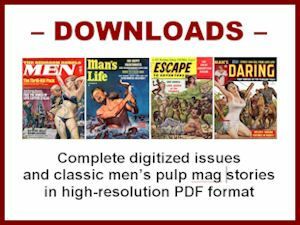 The cover paintings used by most of the 160 or so periodicals in the genre typically featured things like manly action, adventure and battle scenes, or, gonzo killer creature attacks, or over-the-top “sweat mag” style images showing Nazis and other evil villains torturing barely-clothed babes. I have sometimes wondered what Christmas covers on some of those types of magazines might have been like. So this year, just for fun, I decided to create a few hypothetical examples. As readers of this blog know, I and my co-editor Wyatt Doyle are very big fans of killer creature illustrations and stories from vintage men’s pulp mags. It was the famed “WEASELS RIPPED MY FLESH!” cover painting by Wil Hulsey that inspired me to create this blog. And, not long ago we wrote an article about killer creature stories in men’s adventure magazines for issue #42 of HORRORHOUND magazine. So, naturally, I had to try my hand at a killer creature Christmas cover. The result is the cover above — “RUDOLPH RIPPED MY FLESH!” — an admittedly demented variation on the December 1955 cover of SPORT LIFE magazine. Then I started wondering what some men’s adventure magazine covers might look like if Santa Claus made a guest appearance. That led me to create the spoof covers of ADVENTURE, SAGA and BLUEBOOK below, featuring Santa as various types of badasses. Perhaps it’s actually more surprising that there are some real issues of men’s adventure mags that did have Christmas-themed cover paintings. 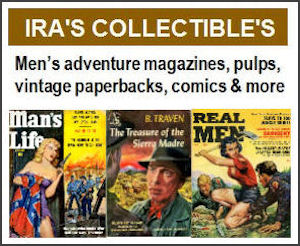 Almost all of them were on ARGOSY and TRUE, two of the earliest and longest-running men’s adventure magazines. 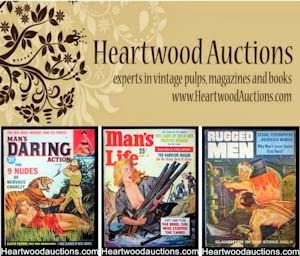 Those were also two of highest circulation magazines in the genre, largely because their content tended to be a bit milder than, for example the “Diamond Group” magazines (MALE, MEN, STAG, FOR MEN ONLY, etc. 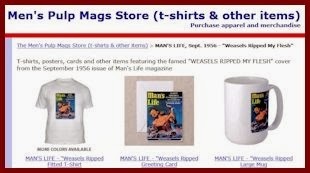 ), or the wild Reese and EmTee mags (MAN’S BOOK, MAN’S STORY, MEN TODAY, WORLD OF MEN, etc.). Below are scans of some classic ARGOSY Christmas covers: December 1954 (cover painting by Walter Baumhofer), December 1956 (cover by Jack Dumas) and December 1959 (cover by Ed Valigursky). And, here are three of my favorite Christmas-themed covers of TRUE: December 1945 (cover painting by Earl Blossom), December 1953 (cover by Stan Galli) and December 1954 (also by Stan Galli). Some other examples have recently been posted in the Men’s Adventure Magazines Facebook group, so drop by there to see them if you have a chance. In the meantime, here’s wishing you a Merry Christmas, Happy Hanukkah, Happy Kwanzaa and Happy Everything Else!